Glaramara is a large fell that sits in the middle of Borrowdale, dividing the valley into two, with Langstrath passing to the east and the main valley to the west. Glaramara is the highest fell between the two branches of the valley, which meet up to the south of the ridge at the false 'Esk Hause', crossed by the Sty Head to Great Langdale path. This an unusual ridge in that it is narrowest at the southern end and expands out to include a large area by the time we reach Glaramara. A large area of high ground is contained between the main Borrowdale valley and Langstrath. Glaramara has fairly steep sides to the east and west, but the top of the ridge is a large attractive undulating area with a great mix of tiny tarns and rocky outcroppings, well worth exploring. The northern ridge, running down towards Seatoller, can be a little wet at times, but the ridge between Glaramara and Allen Crags is a delight (although a little confusing in fog). Glaramara is a great viewpoint - it isn't one of the highest fells, but it is surrounded by deep valleys in every direct apart from the south, and even there the view towards Great End and the Bow Fell area is impressive. The Helvellyn range fills the eastern skyline, to the west the Ennerdale and Buttermere fells can be seen, but the best part of the view is north to Borrowdale, Derwent Water and Skiddaw beyond (sadly hidden in cloud in our photograph). The top of Glaramara is normally reached either along the ridge from the false Esk Hause in the south via Allen Crags or up Thornthwaite Fell from Borrowdale. This northern ridge always feels longer than expected under foot, and it is just over two miles from the top to Strands Bridge. Some of this route can be rather wet. The right of way shown running alongside Hind Gill isn't obvious from the valley bottom. We have a long walk that visits Styhead Tarn and Sprinkling Tarn before returning to Borrowdale along the Glaramara ridge, starting at the false Esk Hause and following the fairly clear path over Allen Crags and onto Glaramara. Glaramara is rather prone to false summits. Coming from the north Combe Head appears to be the summit for some time. From the south there is a minor summit just north of High House Tarn, followed by a steep climb up to a 775m false summit. From here the genuine double summit can be seen across a flat sometimes rather wet area. Of the two the north-eastern summit is the better, sitting nearer to crags and with a better view of Borrowdale. The western boundary of the fell is formed by Grains Gill, which runs north to merge with Styhead Gill and form the River Derwent. The north-eastern boundary is formed by Combe Gill, which runs down The Combe, splitting Thornythwaite Fell and Rosthwaite Fell. 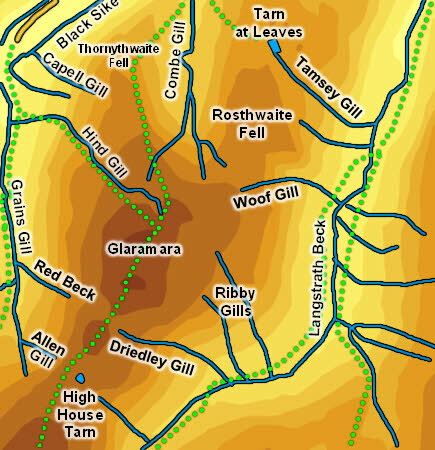 The boundary between Glaramara and Rosthwaite Fell isn't clear, but Woof Gill is a good candidate. The eastern boundary is formed by Langstrath Beck. The southern boundary is rather unclear, but Allen Gill in the west and a nameless beck that runs down the slope east of High House Tarn are about right. A fairly large number of becks are born on the western and eastern slopes of the. In the west Red Back, Hind Gill and Capell Gill have all earned names. Black Sike runs parallel to the foot of the fell. In the east Ribby Gills and Driedley Gill run down into Langstrath. A large number of tiny tarns are dotted around Glaramara. Rosthwaite Fell can boast Tarn at Leaves, one of the best names of any Lakeland tarn. The south ridge has an particular concentration and the boundary with Allen Crags is normally seen as falling around Lincomb Tarns and High House Tarns.